Download "Job Description. 4. To provide and facilitate all needed clinical and social services for the parent and family." 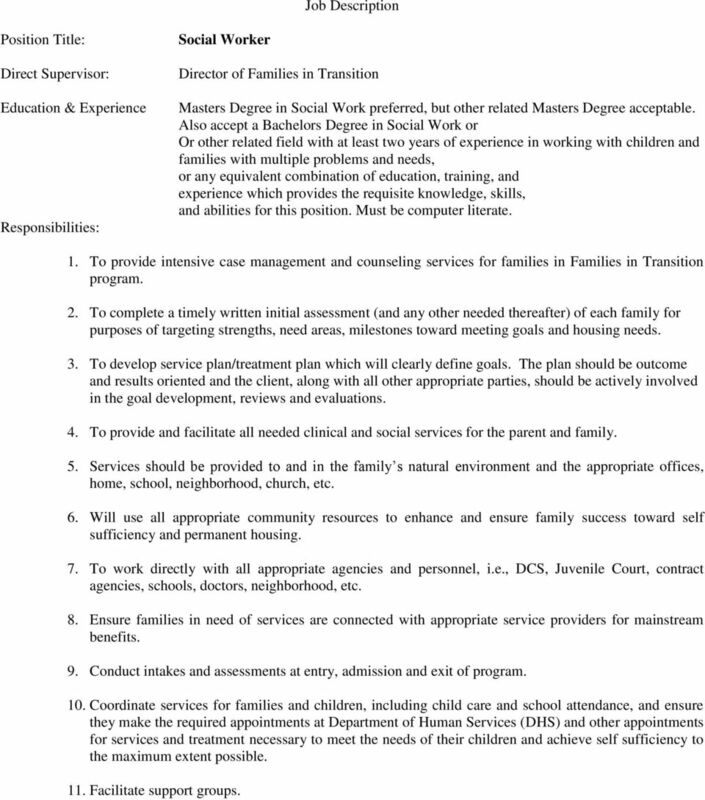 1 Job Description Position Title: Direct Supervisor: Education & Experience Responsibilities: Social Worker Director of Families in Transition Masters Degree in Social Work preferred, but other related Masters Degree acceptable. Also accept a Bachelors Degree in Social Work or Or other related field with at least two years of experience in working with children and families with multiple problems and needs, or any equivalent combination of education, training, and experience which provides the requisite knowledge, skills, and abilities for this position. Must be computer literate. 1. To provide intensive case management and counseling services for families in Families in Transition program. 2. To complete a timely written initial assessment (and any other needed thereafter) of each family for purposes of targeting strengths, need areas, milestones toward meeting goals and housing needs. 3. To develop service plan/treatment plan which will clearly define goals. The plan should be outcome and results oriented and the client, along with all other appropriate parties, should be actively involved in the goal development, reviews and evaluations. 4. To provide and facilitate all needed clinical and social services for the parent and family. 5. Services should be provided to and in the family s natural environment and the appropriate offices, home, school, neighborhood, church, etc. 6. Will use all appropriate community resources to enhance and ensure family success toward self sufficiency and permanent housing. 7. To work directly with all appropriate agencies and personnel, i.e., DCS, Juvenile Court, contract agencies, schools, doctors, neighborhood, etc. 8. Ensure families in need of services are connected with appropriate service providers for mainstream benefits. 9. Conduct intakes and assessments at entry, admission and exit of program. 10. Coordinate services for families and children, including child care and school attendance, and ensure they make the required appointments at Department of Human Services (DHS) and other appointments for services and treatment necessary to meet the needs of their children and achieve self sufficiency to the maximum extent possible. 11. Facilitate support groups. 2 Responsibilities cont d: 12. Will provide 24-hour emergency coverage for client crisis, as deemed necessary. 13. Assist with employment referrals. Verification of employment and work hours when resident has become employed. 14. Ensure data is collected to track clients served and housing stability at three, six, and twelve-months and post-assistance, including monthly reports. 15. Enter client data into HUD s Homeless Management Information System (HMIS) with assistance from Administrative Assistant. 16. The preparation and presentation of workshops for professional and non-professional groups when needed. 17. Will participate in staff meetings, in-services and approved/planned relevant workshops and trainings. 18. Will participate in other agency functions, i.e. Annual Dinner, etc., also including other duties as assigned. II. Record Keeping: 1. Maintain accurate and timely reports for case records according to AGAPE procedures and state minimum standards through data entry into the AGAPE computer system and general documentation in all required areas. 2. Be prompt in initiating and replying to all correspondence and inquires. 3. 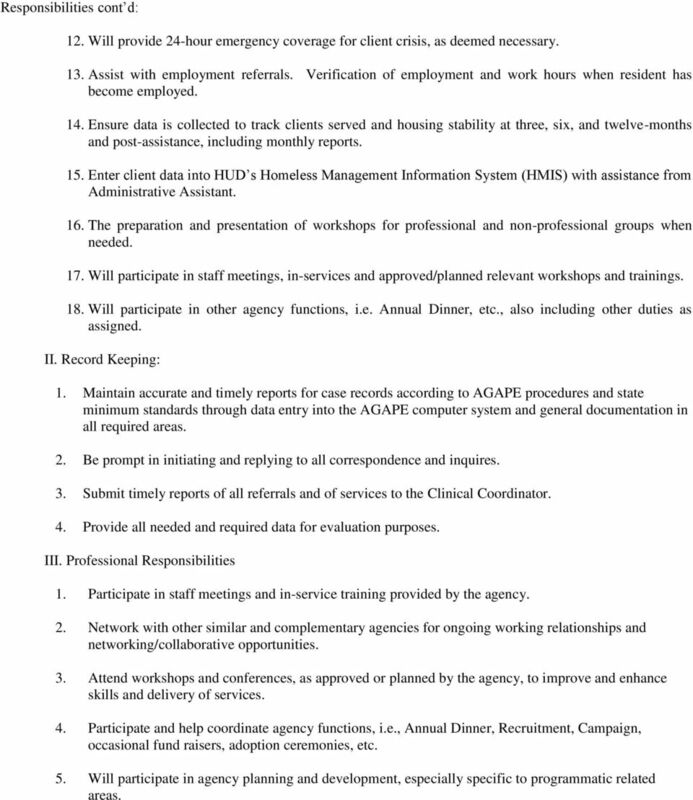 Submit timely reports of all referrals and of services to the Clinical Coordinator. 4. Provide all needed and required data for evaluation purposes. III. Professional Responsibilities 1. Participate in staff meetings and in-service training provided by the agency. 2. Network with other similar and complementary agencies for ongoing working relationships and networking/collaborative opportunities. 3. Attend workshops and conferences, as approved or planned by the agency, to improve and enhance skills and delivery of services. 4. Participate and help coordinate agency functions, i.e., Annual Dinner, Recruitment, Campaign, occasional fund raisers, adoption ceremonies, etc. 5. Will participate in agency planning and development, especially specific to programmatic related areas. 4 IV. Must assure that all services meet child-placement licensure, DCS/contractual expectations and agency policies. V. Must provide or arrange acceptable 24 hour per day coverage for caseload responsibilities when using Annual Leave, sick time or leaving the geographic vicinity during personal time. VI. Must have an automobile available for business use at all times. Must have current driver s license and must maintain current automobile coverage at appropriate levels. VII. Will perform all other duties, within the general scope of this position, as requested by the Social Service Supervisor or Executive Director. 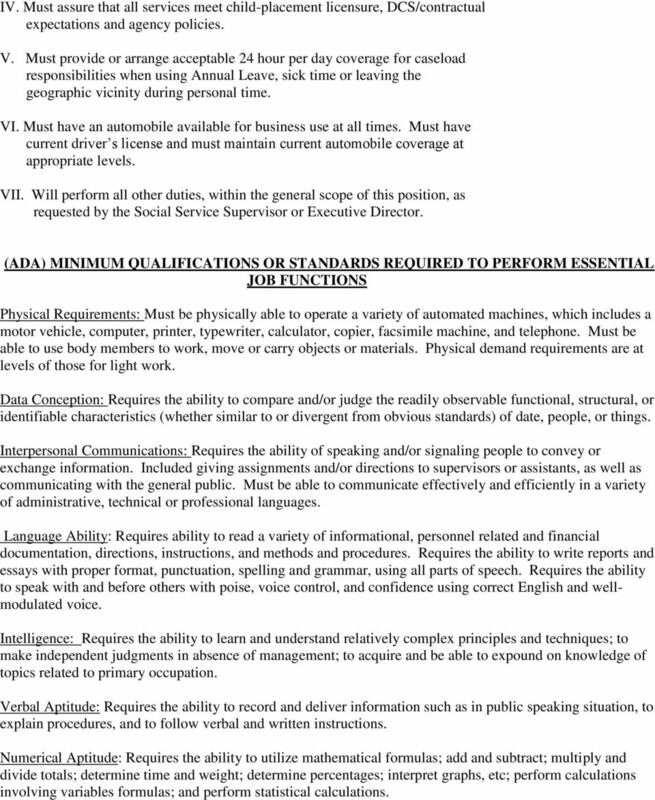 (ADA) MINIMUM QUALIFICATIONS OR STANDARDS REQUIRED TO PERFORM ESSENTIAL JOB FUNCTIONS Physical Requirements: Must be physically able to operate a variety of automated machines, which includes a motor vehicle, computer, printer, typewriter, calculator, copier, facsimile machine, and telephone. Must be able to use body members to work, move or carry objects or materials. Physical demand requirements are at levels of those for light work. Data Conception: Requires the ability to compare and/or judge the readily observable functional, structural, or identifiable characteristics (whether similar to or divergent from obvious standards) of date, people, or things. Interpersonal Communications: Requires the ability of speaking and/or signaling people to convey or exchange information. 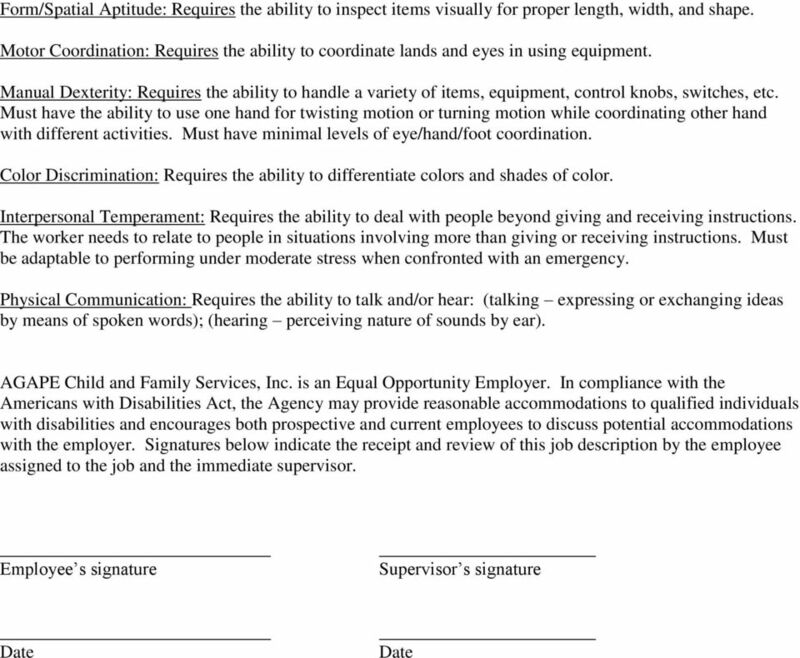 Included giving assignments and/or directions to supervisors or assistants, as well as communicating with the general public. Must be able to communicate effectively and efficiently in a variety of administrative, technical or professional languages. Language Ability: Requires ability to read a variety of informational, personnel related and financial documentation, directions, instructions, and methods and procedures. Requires the ability to write reports and essays with proper format, punctuation, spelling and grammar, using all parts of speech. Requires the ability to speak with and before others with poise, voice control, and confidence using correct English and wellmodulated voice. Intelligence: Requires the ability to learn and understand relatively complex principles and techniques; to make independent judgments in absence of management; to acquire and be able to expound on knowledge of topics related to primary occupation. Verbal Aptitude: Requires the ability to record and deliver information such as in public speaking situation, to explain procedures, and to follow verbal and written instructions. Numerical Aptitude: Requires the ability to utilize mathematical formulas; add and subtract; multiply and divide totals; determine time and weight; determine percentages; interpret graphs, etc; perform calculations involving variables formulas; and perform statistical calculations. RECRUITMENT ANNOUNCEMENT Wasatch Mental Health 750 North Freedom Blvd Suite 300 / HR Provo, Utah 84601 Phone: (801) 852-4735 www.wasatch.